Last Wednesday Esme picked up the terrarium I had ordered for my two tarantulas. One of them escaped months ago, but suddenly showed up 2 weeks ago, which was quite a happy surprise. 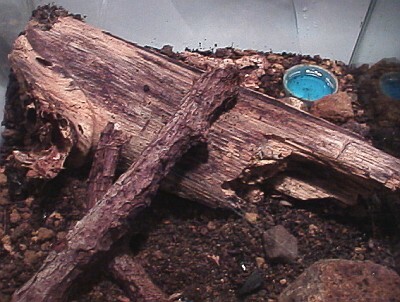 The terrarium is 50 cm x 25 cm x 40 cm (w x d x h ), and divided into two sections. The substrate is a mix of sand, organic stuff, and small stones: pieces of black volcanic glass (no sharp edges), mixed with volcanic stones, and other small stones, radius 2-5 mm. 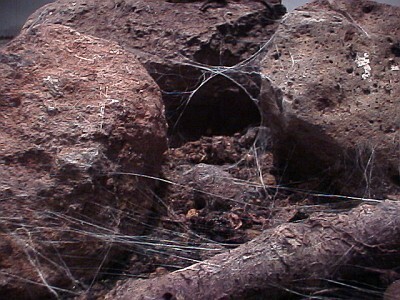 The right part, housing the larger of the two tarantulas (the one that escaped), has 3 big pieces of stone (flat, radius ranging from about 3 cm to 6 cm), some small stones, and a few small pieces of wood. I use the plastic cover that came with an ice cream (Cornetto) to hold some water. Since the dividing piece of glass doesn't go all the way up, I use two pieces of styrofoam touching each other, an idea Esme came up with. For cover I use a piece of glass with a hole in the center (diameter 3mm). I made very sure this time that there are no "small openings", since that's the last time I thought an opening was small enough, a tarantula managed to use it to escape. 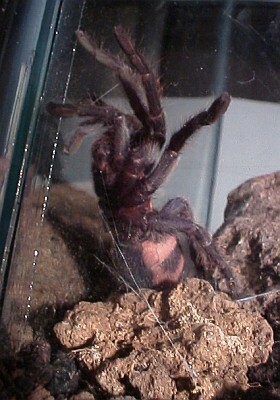 Both tarantulas look like the Costa Rican Tiger rump (Cyclosternum fasciatum), but were collected in Veracruz, Mexico. 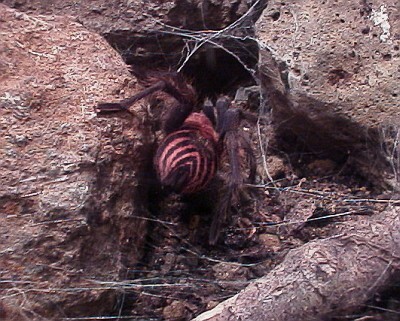 It wouldn't amaze me if this Mexican tarantula is often sold as a Costa Rican Tiger rump, but have no idea if it's indeed the same species, or just a look-a-like. In the case of the former, this terrarium set up might be quite good for your Costa Rican Tiger rump. 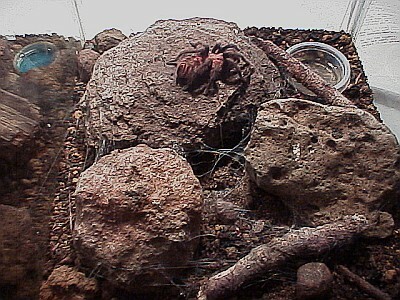 The left section houses a smaller tarantula spider. I used a big piece of wood to provide a hiding place and added some small pieces of wood, a stone (flat, radius about 2.5 cm), and a bottle cup to hold some water. I keep the substrate just a little moist using a spray can, but not too moist (i.e. no condensation on the glass). Since the temperature in the house is around 26 C, inside the terrarium it's around 28-30 C. Lowest temperature measured in the house was around 13 C during the day, but only for a few days. I guess the temperature in the terrarium would not drop below 15 C in such circumstances. 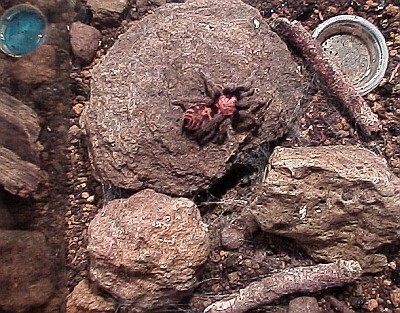 The small tarantula decided that instead of digging under the wood, the spot between the left most part of the wood and the corner of the terrarium was an excellent place to hide, and started to create a hiding place using webbing with soil glued to it. I guess it will molt in about 2 weeks and come out of hiding again to eat several house crickets. 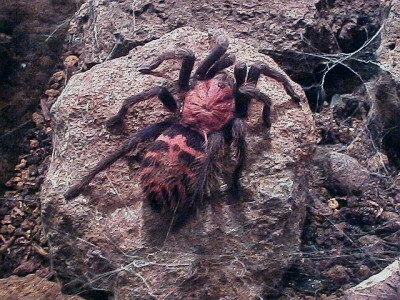 The larger tarantula put quite some webbing on and around the stones, and attached several wires to the glass, roughly 20-25 cm above the substrate. The larger one was somewhere hiding in the house for months, and when I found it back, it looked like it hadn't been eating for quite some time. So I fed it several small house crickets. I currently have 2 tarantula spiders, and the more I observe them, the more fascinating they become, even though I know they can go into hiding for weeks, and are not very active, except when they notice a cricket running around that is. 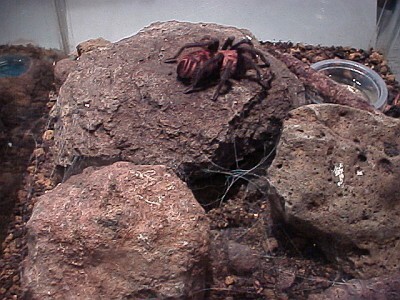 Note: the terrarium might be considered a bit too high (40 cm) for housing a ground dwelling tarantula (which I consider this species to be). I have added a small branch to the section housing the larger of the two tarantulas to observe if it does use it (it does climb upon the glass sides).